The key to this week is keeping it light! Not only are these recipes "figure friendly", but they also seem pretty easy! I admit last week I was a little overly ambitious, I never got to make the mango burgers! I will be making them in the near future I'm sure. As it turns out, there aren't too many opportunities to cook next week anyway...so I planned when I could! Tonight - Not cooking...celebrating with B-Cas! A friend of mine texted me and said she is now inspired to start planning her meals! Thanks Jess, your text made me smile! This got me thinking though...I have been sharing the meals I have been planning, yet I never shared HOW I plan them! 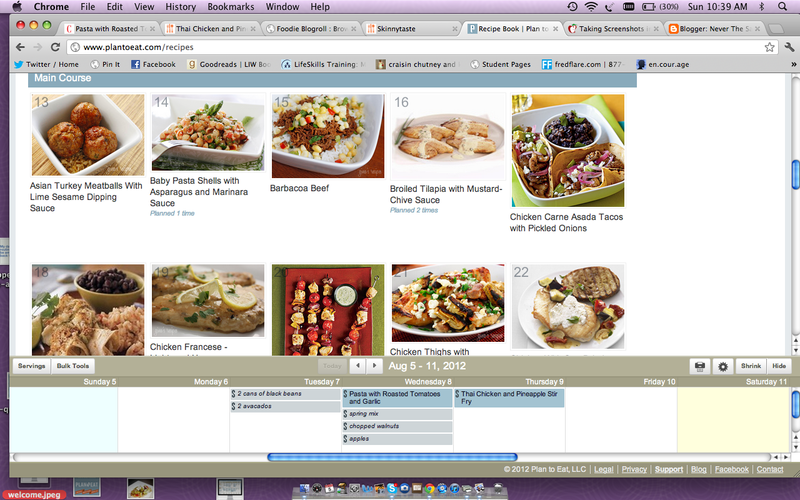 Besides the obvious part where I scour the internet for recipes, on blogs, pinterest, etc....I use the website Plan To Eat! This website has been making my life a BAJILLION times easier for over two years now! I tried the 30 day trial on a whim one day. I wasn't thrilled that there was a membership fee...but I figured I had nothing to lose just by trying it. 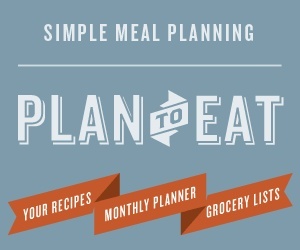 Well, after that first month I was hooked...weekly meal planning just wouldn't be the same with out it! 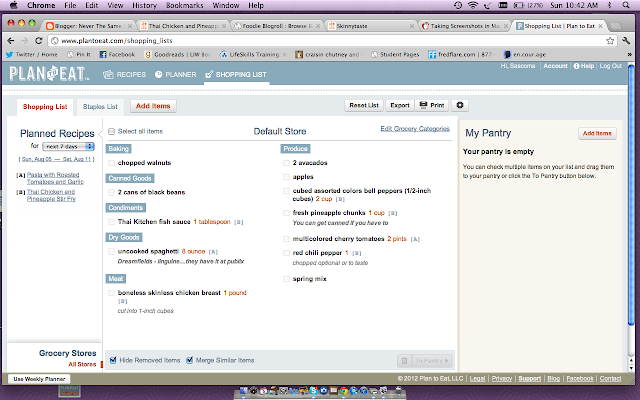 Basically, you import all of your recipes into your account. You can write your own, or load them directly from some websites. Skinnytaste, EatingWell, Cooking Light, Food Network, Myrecipes all import directly into Plan To Eat just by copying and pasting the link. If you want to import a recipe that doesn't directly load....you can still do it, it just takes a little longer because you need to upload a picture, and copy and paste the ingredients and directions manually. Not a big deal though, I have done it many times. After you have your recipes are loaded into your account, you just drag them into a calandar. You can add additional ingredients you may need to pick up as well. When you are finished, it creates a shopping list for you. You can delete all of the things you don't need or already have on hand (for example, things like salt, pepper, olive oil). Then you can either print it out, or e-mail it to yourself. It is the greatest thing ever! It takes a little bit of time to build up your arsenal of recipes...but it is so worth it! What's cooking this week & "Quelf"